If you sometimes feel that you are “walking on a marble,” and you have persistent pain in the ball of your foot, you may have a condition called Morton’s neuroma. A neuroma is a benign (non-cancerous) tumour (“growth”) of a nerve. 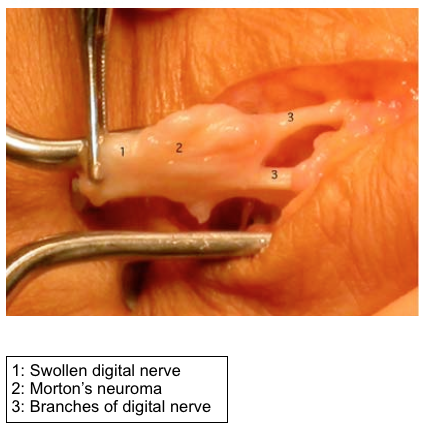 Morton’s neuroma is not actually a tumour, but a thickening of the tissue that surrounds the digital nerve leading to the toes. Morton’s neuroma occurs as the nerve passes under the ligament connecting the toe bones (metatarsals) in the forefoot. Morton’s neuroma most frequently develops between the third and fourth toes, usually in response to irritation, trauma or excessive pressure. Morton’s neuroma occurs in women much more commonly than in men (8 to 10 times more). Normally, there are no outward signs, such as a lump. During the examination, your surgeon will feel for a palpable “lump” or a “click” between the bones. He or she will put pressure on the spaces between the toe bones to try to replicate the pain and look for calluses or evidence of stress fractures in the bones that might be the cause of the pain. Range of motion tests will rule out arthritis or joint inflammations. X-rays may be required to rule out a stress fracture or arthritis of the joints that join the toes to the foot. Usually, an ultrasound scan or Magnetic Resonance Imaging (MRI) scan will confirm the diagnosis. Several studies have shown that a combination of roomier, more comfortable shoes, nonsteroidal anti-inflammatory medication, custom foot orthoses and cortisone injections provide relief in over 80 percent of people with Morton’s Neuroma. Morton’s neuroma surgery can be done as a day surgery procedure unless you have other medical problems that mean you may need to stay in hospital overnight. The surgery is performed under general anaesthetic (whilst you are asleep). A cut is made over the top of the foot, at the base of the affected toes. The operation involves removing the part of the nerve that is causing the pain and discomfort. The foot and ankle are then bandaged. You will be seen by the specialist nurses in the outpatient clinic for removal of the dressings and a wound check. Any stitches present still will be removed. You should usually be able to start driving at this stage although the final responsibility rests with the patient. The Drivers Vehicle Licensing Agency (DVLA) regards it as your responsibility to judge when you can safely control a car. You should contact your doctor or the DVLA if you are concerned about this. You will be seen by the surgeon in outpatient clinic to assess your recovery and to ensure that you have not developed any problems and that you are making a good recovery.